Armies are invariably accused of preparing to fight the last war. Nagl examines how armies learn during the course of conflicts for which they are initially unprepared in organization, training, and mindset. 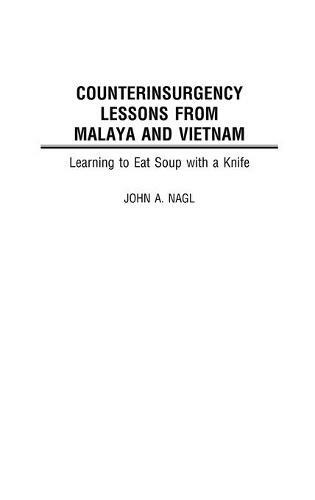 He compares the development of counterinsurgency doctrine and practice in the Malayan Emergency from 1948-1960 with that developed in the Vietnam Conflict from 1950-1975, through use of archival sources and interviews with participants in both conflicts. In examining these two events, he argues that organizational culture is the key variable in determining the success or failure of attempts to adapt to changing circumstances. Differences in organizational culture is the primary reason why the British Army learned to conduct counterinsurgency in Malaya while the American Army failed to learn in Vietnam. The American Army resisted any true attempt to learn how to fight an insurgency during the course of the Vietnam Conflict, preferring to treat the war as a conventional conflict in the tradition of the Korean War or World War II. The British Army, because of its traditional role as a colonial police force and the organizational characteristics that its history and the national culture created, was better able to quickly learn and apply the lessons of counterinsurgency during the course of the Malayan Emergency. This is the first study to apply organizational learning theory to cases in which armies were engaged in actual combat.